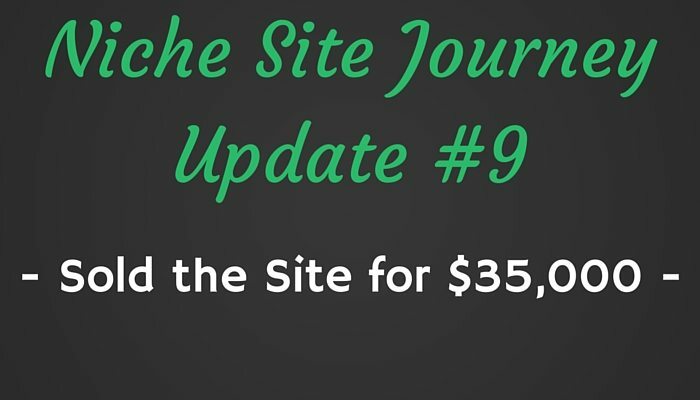 NSJ Update #9 – I Sold the Niche Site for $35,000! NOTE: I sold my NICHE website for $35,000, not this website – Passion Into Paychecks! I have been getting a lot of questions/comments about people thinking I sold PiP. In the last NSJ update, which was at the end of December, I said that the site was valued at around $15,500 if I wanted to sell it at that point. Well, 2 months later I was able to sell the site for $35,000! How in the world did this happen?! NSJ Update #4 – The Site is Ranking in Google! NSJ Update #6 – First Couple of Sales! Alright guys, let’s take a look at how all of this went down! You guys are all probably shocked that I was able to sell this site for $35,000 considering that two months ago I estimated the value of the site at ~$15k, and let me tell you, I am just as shocked as you! In the last update my plan was to hold onto the site until the end of January so that I could have the highest 3 month average as possible so that I could get a good valuation on the site. As I have explained many times, websites are most commonly sold based on their last 3 months average PROFIT multiplied by a 20x multiple. So the plan was to maximize this 3 month average profit and then cash out the site at it’s peak. Well, things went exactly as planned and I was able to do this just as I had hoped it would. Let’s take a look at how I was able to increase the site’s valuation from around $15k to $35,000 in one month. This is by FAR the best month I have ever had from any website that I have owned, and it came at the best time possible. There also was no expenses this month since I knew I was going to be selling the site. I wanted to make sure that I maximized the profits. I want to look at how this extremely good month affected the website’s 3 month average profit and overall value. I want to quickly show you how much of an impact that the earnings from January had on the 3 month average. The site was able to pull in a very nice chunk of change in the last 3 months. However, remember that the site valuation is based on the average of the last 3 month’s PROFITS. So we now have to take a look at the expenses for the last 3 months. The only expenses came from the 3 new PBN links that I added in the last 3 months. I calculated that each PBN link costs me $15. Now that we have the total earnings as well as the total expenses, we can now calculate the average profit for the past 3 months. Thanks to the incredible month in January, the new 3 month average profit is $1,570! With a 3 month average profit of $1,570 we can estimate the value of the site based on the 20x multiple. You are probably wondering why this number is lower than the $35k that I sold the site for. You will see in the next section that Empire Flippers actually used a higher monthly multiple than the standard 20x when valuing my site. How was my Site was Valued at $39,000? When I submitted my site for sale to Empire Flippers I was expecting them to use the normal 20x multiplier to find the sale price. They actually ended up using a higher multiple of 25x! One reason for the higher multiple was because of the quality of my site and that there has been consistent growth in all areas for the past 6 or so months. The traffic and the earnings have all seen growth and this is appealing to potential buyers. The other reason why I was able to fetch a higher multiple was because the market for websites are increasing. More and more people are seeing the ROI websites provide and are willing to pay a higher multiple for a quality website. I can’t even explain to you how happy/shocked I was when I got this email! I was shocked because I was expecting them to use a 6 month average due to there being such a large amount of growth in the last 3 months. I thought they would use the 6 month average because the last 3 months earnings were so much higher compared to the previous months. Not only was I expecting them to use a 6 month average but, I also thought they would use the normal 20x multiple. However, since they used the 3 month average along with a 25x multiple I was able to get an extremely high valuation. I couldn’t believe it! That’s the story behind the valuation of of my site for $39k. I will explain how I sold the site for $35,000 in just a minute. I want to show you how holding the site one extra month was able to add more than $20,000 to the value of the site. My plan was to hold the site one more month through the month of January so that I was able to replace October’s low earnings with January’s earnings. This way I could maximize the 3 month average profit. The plan worked out very well. I was able to replace October’s earnings of $283 with January’s earnings of $2,614! This had a HUGE impact on the value of the site. I was able to double the 3 month average profit of the site by holding it for one more month. In doing this, I was also able to double the sale price for the site as well. So, by holding the site for one extra month I was able to add $20k+ to the sale price of the site! Now that you know the story behind the valuation of the site, I want to now explain some of the details about the sale of the site. As you probably know, I decided to go with Empire Flippers as the place where I would sell my site and I am VERY happy with that decision. Even though EF priced the site at around $39,000 I ended up selling the site to a buyer that offered $35,000 for it. We ended up going back and forth with some negotiations and we ended up agreeing on the $35k mark, which I am really happy with. At first, the buyer offered $32k and I countered him with $37k in hopes of him coming back at $35k, which is exactly what happened. The EF support made it very easy and handled the majority of the negotiations for me which was nice. Empre Flippers takes 15% of the sale price as their commission, which is a little bit high but in my opinion they earned that money. Out of the $35,000 the site sold for, EF got $5,250 and I walked away with $29,750. There was also a $97 listing fee. NOTE: EF only shares the website’s full info with people who put up 5% of the sale price as a refundable deposit. This keeps low ballers out and only truly inetrested parties can view the website. Migration was completed. The migration took a lot longer than expected due to the buyer having some trouble applying to the affiliate program. However, the buyer was eventually able to figure things out and approved the release of the escrow funds from EF to myself. Since it took an extra 3+ weeks to fully transfer the site to the new owner, I was able to keep earning money from the site the entire time. In this waiting time, I was able to make an extra $1,000+. That was how the whole process of selling my website with Empire Flippers went. Overall, the process was very smooth and it took a very small amount of work from me. The only complaint I had was that it took 3+ weeks once the site was sold before the money was released to me. This was the buyer’s fault though for pretty much going MIA for 3 weeks and had nothing to do with EF. Nonetheless, within a months period I listed, sold and received my money for the website. Not too bad if you ask me! Just like the last time I sold my site with Empire Flippers, the entire process was very easy and straight forward. The service was fantastic and allowed me to sell my website quickly and at a very good price. One of the main reasons why I opted to sell my site with EF again was because I knew that I would be able to sell my site in a very short period of time. I was tempted to test of the open waters of Flippa but, I didn’t see a point. I knew that I would get a better site valuation for my site and be able to sell it quicker. Overall, I am very pleased with them and would recommend them to anyone selling a website. To be 100% transparent, I have never sold a website via Flippa or FE International so I can’t compare website brokers. However, EF has done everything I have wanted from a website broker and more. Why Did I Decide to Sell? I touched on a couple reasons for the sale in the last update but, I wanted to explain my thoughts behind why I wanted to sell the site. I could have kept the site under my own control and continue to earn the money it made each month but I decided that it was if I cashed it out now. I sold this website because I felt like it was going to be the peak of the website’s earnings/traffic. This means that it was also going to sell at the highest possible value and I wanted to take advantage of this time period. No matter what type of website you have, there will always be a chance that your main traffic or earning source could get wiped out and the website would become worth a lot less. This website had more risk than a lot of websites because I was very aggressive with using PBN links and Google is always going after PBN links. I wanted to sell the site before anything like that happened to the site and cash out the asset while it was still at it’s highest value. There have also been rumors of a new Google update coming very soon and it was smartest for me to sell it now. I am not going to go into a whole lot of detail here because I did in the last update, however, the affiliate program that I was using to monetize this site did not allow me to use them anymore. This was due to a new nexus law in Washington state and the affiliate program terminated my account with them. To solve this I had to become “business partners” with my grandma in Ohio and create a new affiliate account with them so I could continue to monetize and make money from the site. I didn’t want to keep doing this and have to deal with this situation, I felt it was time to move on. By selling the website I was able to create a large amount of working capital that I can use to invest into new business ventures. Selling the website gives me a lot of money that I can use to find my next business opportunity and start something new! It also allows me to reinvest more into my Amazon FBA business with new products. Also, I am a college student that has to pay bills each month and the extra cash doesn’t hurt. I started this website from scratch way back in June of 2014. Since then I have built it up to a point where it was earning a substantial amount of money each month and I have documented the entire process within this NSJ case study. Now that this Niche Site Journey has come to an end, I want to look at the stats from the very beginning all the way up to the end when I sold the site. This includes looking at the traffic growth since the beginning and getting a complete look at the amount of money this site has made me during it’s lifetime. The first stat I want to look at is the traffic growth. It will be interesting to see what has happened in terms of traffic stats since I created the site. Above is a look at the complete traffic stats from the very beginning to the point that the Google Analytics were switched over to the buyer. The reason for the large drop off at the end is because there is only 6 days worth of traffic stats in March before the site was handed over to the new buyer. Aside from that, you can see that the site saw very consistent growth month over month since it was created with a large surge in growth over the past few months. The first phase was the first 12 months of the site’s life. The first year was focused on adding the “pillar articles” to the site and adding PBN links. I knew that with the Google Sandbox in effect that I wasn’t going to get extremely quick Google rankings and traffic growth, I was prepared to wait a good chunk of time before I saw success. The first 12 months was focused on building the foundation for the site with high quality content and PBN links. After I did that I knew that I would have to give it time to rank in Google. The site saw growth just about each month in the first 12 months but, it wasn’t until a couple of months later until the growth really started to explode. One thing I want to mention is that the first 12 months of a site’s life usually isn’t very successful and most of the time it won’t earn very much money. This is discouraging for a lot of beginner niche site makers and they end up giving up because they don’t see results quick enough. It is important to have patience and give the site time to grow and see success. During these 5 months is when I really started to see growth month over month. At this point, the site has been live for over 1 year and it really started to take off after that. During this time period I added a handful of supporting articles to the site, I talked about these in the last update, which I started to bring on longtail traffic as well as boost some rankings for my pillar articles. I didn’t add very many new PBN links and I think most of the growth came from increased rankings now that the site was over one year old and from the new supporting articles. The last phase takes into account the last 3+ months of the site’s lifetime. During this time period the site saw massive growth compared to the previous months. What caused this large growth in traffic? The first being that this was the holiday season. The niche the website was in lends itself well to being bought as gifts for other people and I think this was a major reason for the increase in traffic during November and December. However, I don’t think that was the only reason for the growth because January had just about the same amount of traffic that December had. One of the biggest reasons for the surge of traffic was due to some news within my site’s niche. I am not going to share what niche my site is in but, just know that this news caused people to stock up on items within this niche in case of future problems. This caused a surge in both traffic and earnings during these few months which is where a good chunk of the growth came from. Due to this, I sold the site at the optimal time during it’s peak in terms of both traffic and earnings. The large majority of the site’s traffic came from Google organic search, which is not surprising to me since that was where my focus was at. If I was going to hold the site for 6-12 more months my focus would be to build up a social presence, mainly on Facebook. The niche this site was in would have lend itself well to being able to build up an audience via Facebook. 3 pages on my site accounted for the bulk of the site’s traffic and pageviews. These 3 pages were a main focus with PBN links and also with having high quality articles. These main 3 articles were also the very first pieces of content that I added to the site as well. The other articles on the site either received a very small amount or absolutely zero PBN links and most of the traffic is from ranking naturally within Google for longer tail keywords. A lot of them are also fairly new so over time they would start to gain more traffic. Now it is time to look at the most important metric for any website, how much money does/did it make? Below I will add up the total earnings from all of the different sources of income along with screenshots for proof of earnings. Also, remember that I had to switch affiliate programs in the middle of October 2015 due to a nexus law within Washington State. That is why I have multiple affiliate accounts for two different time periods. The first source of income we are going to look at is my first affiliate program that I had. I used this program from the creation of the site (June 2014) until the middle of October 2015. I earned close to $3k from this affiliate program! You can see the steady growth in terms of earnings that the site went though in it’s first couple of months. It hovered around the $200 – $300 level all the way until September 2015 when it saw a boost up to around $500/month. Shortly after that, I was forced to switch affiliate programs. I switched affiliate programs right around the same time that I started to see a large amount of growth in the traffic. That is why I was able to pull in over $6k in such a short period of time! A much smaller amount was made from Amazon mainly because there weren’t very many products that I sold on my site available on Amazon. That is why I was only able to $138 during the entire time I had this site. Now it is time to add all of the earnings up to find the total amount of earnings that the site made me. All in all, the site was able to make over $9,000 in 21 months, which comes out to $442.55 per month on average. Just to give you an idea of how the earnings grew from the start to the end, I have put together a line chart that displays the earnings by month (excluding March due to only having 6 days of earnings). This graph really emphasizes the amount of growth the site saw in terms of earnings during the last few months that I had the site. The dip at the end in February looks like it was a bad month even though the site made close to $1,000 that month. However, remember that the site was sold in the middle of February so the sale price was based only on the earnings up to the end of January and didn’t take into account the earnings from February. Looking at the revenue earned is great but, we can’t forgot to account for the expenses. The majority of the expenses have come from PBN links and new content. Aside from those two things there isn’t a whole lot of expenses needed to grow this site. This site was created and grown with slightly under $1,000 in expenses. As you can see, this $1000 was a very good investment as the site generated over $9,000 in 21 months and was sold for $35,000. That leads us into the next part of the article. I am now going to take into account the total revenue generated, all of the expenses as well as the amount of money I made from selling the site so we can determine the total amount I made from this site. So after EF got their 15% and I paid for the $97 listing fee I ended up making a total of $29,653 from selling the website. Let’s now add this amount to the revenue that was generated along with the expenses to get the exact amount of profit that was made. In a little more than 21 months this website has made me around $38,000 in profit. Looking at the difference between the revenue generated vs. the amount I made form selling the site you can see how profitable selling websites can be. What I mean by this is that the website generated only around $9,000 in 21 months but, I was able to make 3x that amount just from selling the website. This is going to bring us to the end of the Niche Site Journey. It has been a good ride and I feel like I was able to outline each step of the process that I took to build this site up for you all. You saw every thing from the very beginning to the end of the whole thing and it should give you a good idea as to what it takes. I hope that you all enjoyed each of the NSJ updates and were able to learn a thing or two from it. I had a lot of fun documenting the entire thing and I appreciate you all for following me along the way. I want to give a huge shoutout to anyone that has been reading this case study from the beginning. I know there aren’t that many people because back when I started this NSJ my site was only getting 10/visitors a day! Alright, that’s gonna do it! Thanks for reading and feel free to share it with your friends and leave a comment below. Hello and welcome to my site! My name is Josh Shogren and I am 21 years old. Follow along as I try to turn my passion into paychecks. very well done! sweet deal on the sale! This is awesome and all of these posts have been awesome. It’ll be interesting to see what they say on reddit when you post this update since last time there were people saying you won’t even get a 20X valuation LOL. Congrats! Hey Jay – I truly appreciate you reading! I think you may be confusing this website in this article with the website that parents and I are using as an investment. The website investing case study is the one that I have been posting on reddit! You did it Josh. Congratulations. I guess you are full of strange emotions now lol. Do you feel loss of something dear to you? or a huge weight off your shoulders? Congrats man! That is awesome! Really happy to hear it worked out for you. I like that you are going to use some of the profits to re-invest in the FBA stuff. I like reading that and am in the early stages of doing my own private label product as well. Hey man – thank you! EXTREMELY impressed. Nice work Josh!! Well done! Excellent work by such a young guy like you! BIG BIG CONGRAT TO YOU AGAIN!!! You make a lot of people very motivated to want to try it out too! Oh by the way, since you sold this site. WHERE ARE WE FANS GOING TO FIND YOU??? AWESOME! Gratulations Josh. You did it! 30K in working capital, wow. New PL products, here you come! Very happy for you! Impressed with the results. Nicely done. However, one thing I like to point out is that you mentioned PBN links and the associated risk related to Google. Did you disclose this to the buyer at all? I understand the buyer has to do their homework as well, but it almost comes over a little shady from your end. Don’t take that personally, but I assume you do not want to be seen as a hit and run operation?! I understand what you are saying but, the fact that I used PBN links was fully disclosed to the buyer and he was willing to take that risk for himself. Hope that makes sense and clears things up! Awesome update. It is cool to see someone who spends so much time carefully documenting all of this information (which seems like quite the chore) to keep us as informed as possible. Looking forward to hearing about your future ventures. You mentioned you had to re-apply to an affiliate program after the Nexus issue. Did you simply re-apply to the same affiliate network with your Grandmothers Ohio address or did you start using a completely different affiliate company that had the same products as the first one? I know AvantLink affected a lot of affiliates based in WA State when the Nexus law started last Sept. This whole nexus law is pretty unfortunate and if it continues to affect my businesses I may have to move to a different state at some point. Wow, nice cash out! The last site I sold through EF also took longer than expected for the buyer to confirm. I thought their customer service was going downhill, but maybe it’s just that they’re growing so fast. Maybe I’ll give them another shot – especially if they’re doing higher valuations now! Yup, EF has been great for me and the long wait time was not due to EF’s customer support but because the buyer went MIA after they bought the site. Thanks for the comment! That’s’ Awesome Josh. I am doing online business from last 5 years and I had good success with affiliate marketing. But I have never tried with Amazon affiliate. After reading your posts I am thinking about to open an amazon affiliate site. For Example: suppose I am getting 20,000 visitors per month for Keywords Like best (product name) and (product name) review, Average sale price of product $30. How much income should I expect from these figures. You had an experience with amazon and I just want to take a decent estimate before starting. Hi Ken – Thank you! Good question, I told the buyer that I was going to keep all of the PBN links in place and they will remain pointing at the site. This is a common practice when it comes to selling a site that uses PBN links. Wooow Congrats Josh , well done . Can we know what is the site now that u sold it ? Since you sold it can we have a look at the site? Great work, Josh. Congratulations. I’ve been following through the whole journey and really enjoyed it so much. So, can we expect another niche site case study? Thank, I truly appreciate the comment and the fact that you read through the whole case study. That’s awesome my man! As for another niche site case study, possibly. I am more focused on buying established sites and improving them instead of starting sites from scratch. It just makes more sense to me since I have some capital to do so. Awesome job. Mind asking where you bought your PBN links from? Always looking for good sellers. Thanks! I didn’t buy my PBN links from anyone, I setup my own PBN links and used them for my sites. Was your niche site a WordPress site or an HTML website, a template that you purchased? If you use a particular theme would you mind sharing what it is? What was the homepage setup like? Did you create your own videos for your articles or use youtube videos and how did they relate to your article? How did you link to your affiliate and amazon, banners, in text links? I have read your whole journey which was super successful so I would like to start my own journey following your strategies as closely as possible. 1. I used WordPress for my site. WordPress is super simple to use and makes creating a site a breeze. No need to know html or any other coding skills. 4. This niche site used youtube videos that other people created. What makes a niche a good niche to choose. What makes a niche a bad niche to choose. Thank you! To be honest, a good niche is one that I can rank a lot of keywords for in Google and there are products that I can sell as an affiliate. Aside, from that I don’t care what niche I go into as long as there are those two things. Big fan of the site , i’m young guy from france who has definetly been inspired by your blog . I had a quick newbie wordpress question regarding niche sites , I’m launching my first site soon and I wanted to know if you could offer any advice regarding themes ? I’ve read that some themes that are advertised as ” SEO friendly” , could actually have bad or malicious programming that could affect a sites google ranking. Could you recommend any themes that are known for safety and security ? Or would you suggest sticking to the default wordpress theme ? I have a question to ask related to PBN links. How many site PBN did you build to get your site ranked like 10 site PBN, 15, 20 etc. Also would you be interested in telling the domain metrics of the PBN sites as well ? Last question. What was the Keyword Competitiveness of your primary keywords which were ranking on first page? I used around 20-30 PBN links for this site and most of the PBN links had a trust flow above 20. That was the main metric that I have used to look at PBN sites. I am not sure what the keyword competitiveness for the keywords were because I do not use Long Tail Pro anymore. However, they were relatively easy to rank for! Thanks for the reply man. I am adding PBN links to my site and will surely keep your advice in mind regarding 20+ TF to build PBNs. If I am able to sell it like you did which is apparently pretty difficult then I’ll surely let you know. Thanks mate . Appreciate it ! I’m back with another question , what’s your take on reviews sites that actually have a store page directly on the site that allows people to actually add your selection of items to the a cart and then takes them to Amazon once they check out ? I’m in the middle of designing my review website , and I’ve been thinking about linking to a hypothetical onsite store at the bottom of my articles rather than a direct link . Would you recommend this or is it better to link directly ? Awesome Josh! I am building a niche site and your updates have been incredibly useful. I will say I am very hesitant to build PBN links. With the possibility of google’s new update would you recommend going forward using PBN links? Love the site and congrats on the sale of the site!!! One question I have from a metrics standpoint is what would you say (ballpark) your profit per hour invested is from the total sale + ongoing business profits? Really awesome journey, for someone that would like to star an affiliate site , in your honest experience. What type of niche will be better and what type of affiliate network will be? i have been panning Amazon but I am not sure if the 4% of the commission will be good. Thank you! Amazon is a great affiliate program to start with because they have such a wide variety of products for you to choose from. They commissions may be low but the selection makes up for it as well as the 24hr cookie. Congratulation for this amazing sale, i came to know about you from Doug’s blog, this is really awesome and you did it. Good Luck for your next Project! I just visited your website about bluetooth speakers. Cool how you really put to practice what you learned, congrats! I was wondering if you got any results/revenue 😉 from your site already? Did you also set up and used your PBN? The PBN seems to me is a big factor in the success of a niche site. damn smart. i wished i would have continued making niche websites to the point where i could sell them for 5 figures. congrats. do you think start a new niche site from scratch is a good idea? could i make the site profitable within a few months? problem is im not a good writer and i dont feel like paying outsourced workers overseas. Thanks Robert! Starting a site from scratch is a good idea if you are willing to wait 6-9 months before it makes anything worthwhile (usually). Also, you are going to either have to write your own content or outsource it, there isn’t really any other option. You posts are great, they must take you days to write, please know that I and I am sure many others appreciate your efforts. Would you say there is the possibility of buying a site on Flippa, holding for a short while and doing some small improvements (design, SEO, rewriting content) and then selling on Empire. Or are Empire guidelines designed to rule that out. Another great post, Josh. I love reading your stuff. It is straight forward and informative. I love how you timed your sale for peak profitability. I’ve built a Lawn Care Fairhope site in hopes of finding a company that it can help. My marketing has been slow, but I am going to get busy. Thanks again for all of your articles. I read a lot of your articles in the last few days. They are really inspiring! Especially because I’m a 22 year old student. I came across your website when I was doing some research about Amazon FBA businesses. Prior to this I was doing research on e-mail marketing. I’m really just looking to make some money online, but I’m not sure what to chose. The first one is, why didn’t you also put some ads on your website for extra revenue? Or did you? The second question is about e-mail marketing. Did you think about creating an e-mail list of the people visiting this niche site to monetize that traffic even after you sold the website? I’m looking forward to hear from you. Maybe we can get in touch via e-mail or skype? Kind regards from Belgium. Your content is great! !